A guide leading "Sam the Snot" away from the lecturn. 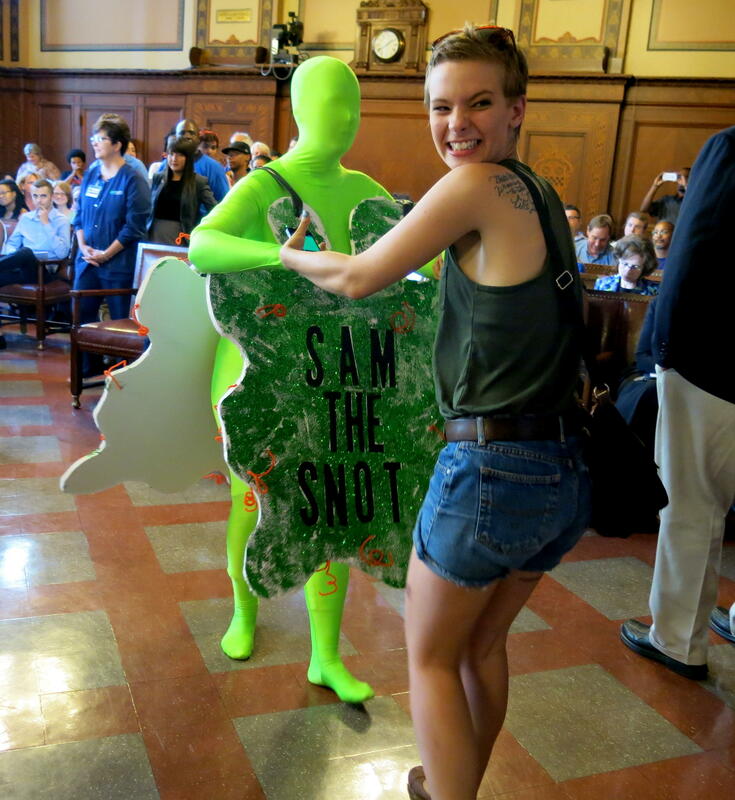 The giant booger was speaking in favor of paid sick days legislation being considered by Pittsburgh City Council. “We strongly oppose this legislation,” said John Graf, president and CEO of the Priory Hospitality Group and a member of the Northside Northshore Chamber of Commerce, which he said represents more than 170 small businesses. Graf was one of several speaking out against the legislation; he said it would put a strain on businesses and eventually cause them to close their doors. Those who support the bill said it will do no such thing. The Paid Sick Days Act was introduced by Councilman Corey O’Connor earlier this month. Its amended version would require businesses with 15 or more employees to allow workers to earn one hour of sick pay for every 35 hours worked with an annual cap at 40 hours. Employees at smaller businesses would accrue fewer hours. Jeff Cohen, chairman of the Pennsylvania Restaurant & Lodging Association, said that leaves the door open for employees to take advantage, and added it’s not paid sick leave, but rather paid days off. Jeff Cohen, chairman of the Pennsylvania Restaurant & Lodging Association, drew jeers and fake coughs and sneezes as he voiced opposition to the Paid Sick Days Act. At this, the standing-room crowd feigned coughs and sneezes behind Cohen to drown him out. His time was already up, but it prompted Council President Bruce Kraus to speak up. Cohon fake-coughed as he left the lectern, but things calmed down after that, though some comments still drew gasps and quieter jeers. Julie Curry works at a Giant Eagle in Washington County. This legislation would not impact her at this time, but she says its passage would cause a chain reaction. Curry wraps fresh meat and handles prepared foods such as meatballs and meatloaf. She said she and others aren’t looking for free days off, just for time to care for themselves or for family members. “If I’m sick, I either have to call off and lose pay and get points toward my attendance, or I come to work sick and infect my coworkers and ultimately the public,” she said. Curry said if an employee gets a specific number of points off attendance, they are removed from the schedule. Nikki Liu of Service Employees International Union 32BJ clarified that paid sick time won't be given to every employee off the bat, but that it must be earned and accrued. Council President Bruce Kraus outlines rules of the public hearing. Council members Corey O'Connor and Darlene Harris were among those in attendance. Other opponents said the proposal was pushed through too quickly, is too broad, will cost employers and may even promote unhealthy behavior by not holding workers accountable for their health. Philadelphia, Seattle, Portland, Ore., and San Francisco have all passed similar accommodations. City Council is slated to reconsider the bill next week. “This is Pittsburgh. We want French fries on our sandwiches, not (the flu),” Councilman Corey O’Connor told a group of supporters shortly before introducing legislation that would mandate paid sick days for all workers in the city. 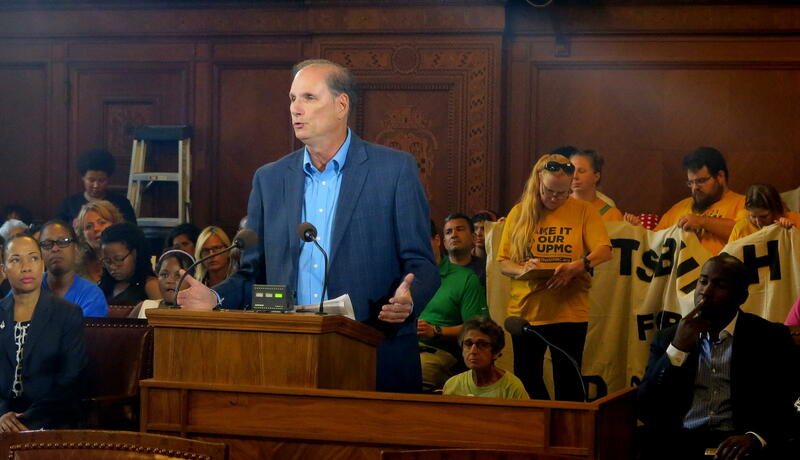 Pittsburgh City Council voted on Wednesday to hold the Paid Sick Days Act for one week so the bill can be amended and council can hold a public hearing July 30. Councilman Corey O’Connor of Squirrel Hill agreed to amend his own bill. In it's original form, the bill required businesses with 15 or more employees allow workers to accrue up to 72 hours of paid sick leave per year, and those with less than 15 employees up to 40 hours of leave. An employee would have to work 30 hours to earn one hour of sick leave.